The greatness of the medieval Chola Empire built up by Rajaraja Chola - 1, Rajendra Chola - 1, Rajathiraja Chola, Rajendra Chola - 2, Rajamahendra Chola, and Virarajendra Chola, was upheld by them for three generations up to the end of the Patri-lineal king Virarajendra. While Rajaraja - 1 ruled from ‘Thanjavur’ all his successors ruled from ‘Gangaikonda Cholapuram’. The Chola Emperor Rajaraja Chola - 1 (A.D.985-1014) gave his daughter “Kundavai” in marriage to the Eastern Chalukiya king “Vimaladityan (A.D.1011-18)” of the Vengi Country, a kingdom in East India in between the Tungabadra anf Godavari rivers. Website URL of the Video on Rajaraja Chola's "sending off" of his daughter Kundavi (Chola Princess) with Vimalaadityan Chalukiya king to Vengi Naadu - as portrayed in the Tamil Film "Rajaraja Cholan"
Their son was “Rajaraja Narendra”. Recent statue of "Rajaraja Narendra" at Rajamahendravaram (the present Rajamundry of Andhra Pradesh). Rajamahendra was a title of the Chalukiya/Chola king "Rajaraja Narendra" - grandson of the Chola Emperor the Rajaraja Chola - 1 of the Chola Empire - who built a new city named as Rajamahendravaram after his title. Rajendra Chola - 1 (A.D.1012-1044) gave his daughter “Amangai” in marriage to the Eastern Chalukya/Chola king “Rajaraja Narendra (A.D.1022-61)”. Their son was Chalukiya/Chola “Rajendra Vishnuvardhanan”. Rajendra Chola - 2 (A.D.1051-63) gave his daughter “Mathuranthahi” in marriage to the Eastern Chalukya/Chola king “Rajendra Vishnuvardhanan (A.D.1061-1070)”. Their son was “Vikrama Cholan”. "Virarajendra Chola (A.D.1063-1070)" of the Patri-lineal dynasty ascended the Chola throne in A.D.1063. His authority extended in the north upto the Tungabadra river. He appointed his son "Athirajendra Chola (A.D.1067-70)" as his heir apparent in the year A.D.1067. During this period the Western Chalukya Country in the north beyond the Tungabadra river was ruled by the king "Someswara – II" (1068-1071). His younger brother "Vikramaditya" the Western Chalukya prince, with intention to invade the Chola country moved southwards beyond the Tungabadra river (most ‘possibly’ around A.D.1069). “Virarajendra” possibly very weary over constant wars with many countries from the time he ascended throne, and also not prepared to loose his vast territory up to Tungabadra river, came into terms with the Chalukya prince “Vikramaditya”. In accordance with their terms, the “Vikramaditya” agreed to withdraw northwards beyond Tungabadra river, thus enabling the Chola king “Virarajendra” to retain the territorial integrity of his empire. This bond of friendship resulted in they exchanging presents, and "Virarajendra Chola" giving his daughter (name not known) in marriage to the Western Chalukya prince "Vikramaditya - VI" . Not long after this event in A.D.1070 “Virarajendra Chola” met his misfortune of severe ill health, ‘possibly’ with imminent death at any time. During this ‘same time’ his son “Athirajendra” who was his heir apparent too fell very ill ‘possibly’ with an incurable sickness, and had no male heirs to succeed him. “Virajendra Chola” under these circumstances with much foresight into the future of the Chola empire, in the year A.D.1070 in his deathbed appointed his own sister “Amangai”s son “Rajendra Vishnuvardhanan”, as the heir apparent to the Chola empire after “Athirajendra”. “Virarajendra Chola” met his death soon after that year, and there rose a rebellion at Kanchipuram against “Athirajendra Chola” the legitimate successor to the Chola empire, who was ousted from the throne. On hearing same the Western Chalukiya prince “Vikramaditya” pursued quickly with his forces to Kanchipuram punished the corrupt people in this rebellion, and then moved towards Gangaikonda Cholapuram broke the rebellion’s army and installed his brother-in-law “Athirajendra” back on throne. Prince “Vikramaditya” stayed at Gangaikonda Cholapuram for a month, probably until the situation properly settled, and then returned to ‘Kalyani’ the capital city of his Chalukya kingdom north of river Tungabadra. However not long after “Vikramaditya”s return, “Athirajendra Chola” who was suffering from an incurable decease for long demised. On hearing of same, the Eastern Chalukiya/Chola king “Rajendra Vishnuvardhanan” the "heir apparent" of the chola country and the king of Vengi country came with his forces and seized the Chola country for himself. His claim ‘to his right’ to succession on the Chola throne was justified, as he was appointed by “Virarajendra Chola” as the "heir-apparent after “Athirajendra”, and his queen, mother, and grandmother, were all Chola Princesses. Thus the Eastern Chalukiya/Chola king “Rajendra Vishnuvardhanan” became the next king of the mighty Chola empire with his new Chola royal title the “Kulothunga Chola - 1” (A.D.1070-1120). The Matri-lineal Chalukya/Chola kings namely “Rajaraja Narendra” and “Rajendra Vishnuvardhanan”, ruled the Vengi country consecutively, after the last Eastern Chalukya king “Vimaladityan”. The Vengi country was a region in East India between Tungabadra and Godavari rivers adjoining the sea. While Kulotunga Chola - 1 was the king of Vengi Country he built a new 'seaport city' closer to Rajamahedravaram (present Rajamundry) and named it as 'Kulothunga Chola Pattinam' after him. (This sea-port city is the present Visakapattinam of Andhra Pradesh). He subsequently became the Emperor of the Chola Empire with the Chola royal title as Kulothunga Chola - 1 with his seat at Gangaikonda Cholapuram in Tamil Nadu. During this time he appointed Vikkrama Cholan his son by the Chola queen Mathuranthahi as the king of Vengi Country under him. This gave “rise" to the rule of the Chola empire by the Eastern Chalukiya/Chola Matri-lineal dynasty, with the “fall" of the “Chola" Patri-lineal dynasty. 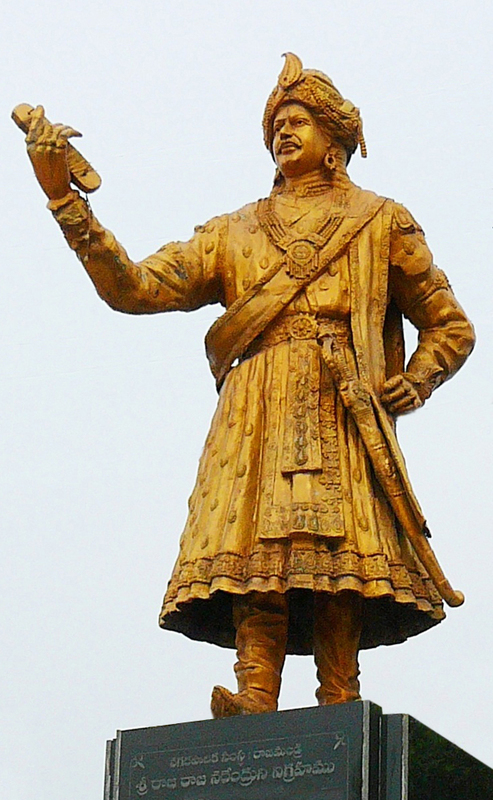 “The king Vikramaditya" the “Western Chalukiya" Prince possibly had his own designs, and with the death of “Athirajendra” he prepared to invade the Chola country. On this development “Kulothunga Chola - 1” arranged with the ‘hostile’ elder brother of “Vikramaditya” namely “Someswara – II” to attack him from the rear, while he invaded the region with his own forces, to meet prince “Vikramaditya” face to face. However prince “Vikramaditya” won over “Someswara - II” who was deposed from the throne, and also drove the Chola forces beyond Tungabadra river and returned to the Western Chalukya capital ‘Kalyani’, probably abondoning his intention to invade the Chola country. Thus “Vikramaditya – VI (A.D.1071-1126)” became the next successor to Western Chalukya kingdom. “Kulothunga Chola” with his ascension on the Chola throne, gave the kingdom of Vengi country to his paternal uncle “Vijayaditya – II” (A.D.1070-1075) [Rajaraja Narendra’s brother] to rule. He thereafter made his fourth son “Vikkrama Chola” (A.D.1118-35) as the heir apparent to Chola Empire. Thus the Chalukiya/Chola Matri-lineal dynasty of Chola empire continued even after Vikkrama Chola, with Kulothunga Chola - 2, Rajaraja Chola - 2, Rajathiraja Cholan - 2, Kulothunga Chola - 3, Rajaraja Chola - 3 and Rajendra Cholan - 3, after which the Chola country was finally subdued by the Pandiyan king Maravarman Sundera Pandiyan (A.D.1216 - 1238). The medieval Chola kings often gave their daughters in marriage to the kings and princes of the other countries (who were not necessarily from the Tamil Royal dynasties), in order to strengthen their position with the neighbouring and far lying kingdoms of their period. It has been already seen that Cholas had matrimonial alliances with the Eastern & Western Chalukyas of India. Likewise we also note Kulothunga Chola - 1 (A.D.1070-1120) gave his daughter "Suththamalliaalvaar" in marriage to the Sinhala/Pandiya Prince Manabharana (alias Virabahu alias Virapperumal) to strengthen his new friendly ties with Sri Lanka. Prince Manabharana - was the son of a 'Pandiyan Prince' by 'Mitta' the younger sister of the Sinhala king "Mahalu Vijayabahu". I couldnot refer to the text of the “Charala Copper Plates” of Virarajendra at the time of posting this Thread. However after subsequent reading through same, a supplementary note to this Thread will be made in this Forum - if necessary. Last edited by virarajendra; 23rd September 2018 at 12:00 AM. All times are GMT +5.5. The time now is 03:59 PM.